← Just what are local arts and crafts anyway? 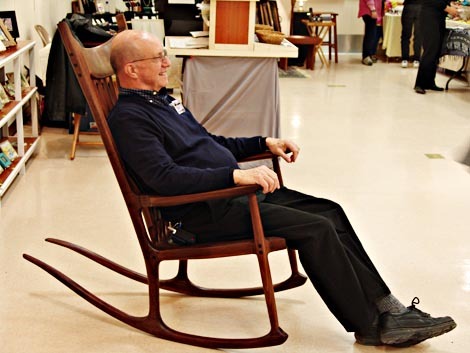 We’ve just concluded a two day Winterfest Arts and Crafts fair at the Jacksonville Center in Floyd, VA.
Just before closing, I finally had time to enjoy a moment in one of Douglas Alan Terrill’s elegant Appalachian rockers which were the talk of the show. They are based on the work of Sam Maloof, America’s most widely admired contemporary furniture craftsman. These rockers are more than furniture. They are sculptures that bring out the spirit of the wood. This rocker looks like motion captured in flight and it is every bit as comfortable as it is beautiful. This is a $3800 rocker and for the discriminating customer it is well worth it when you consider that a Sam Maloof original costs more than $12000 $25000! The image to the right is a Sam Maloof rocker. Thank you, Douglas, for a most enjoyable few minutes. I will have more about this artist in a future article. He has no website yet, but you can contact him by email. Doug’s chairs are truly a work of art. He puts an unbelievable amount of care and hard work into each one. I see people drool over them at the “Over the Moon Gallery” in Floyd where Doug has one for sale. I went to the link you provided on Sam Maloof because I was curious as to how the two craftsmen compare. I find they are similar in their passion for the craft. From visiting Doug Terrill’s shop, and reading this article, I can truly appreciate the effort it takes to build just one of these beautiful chairs.